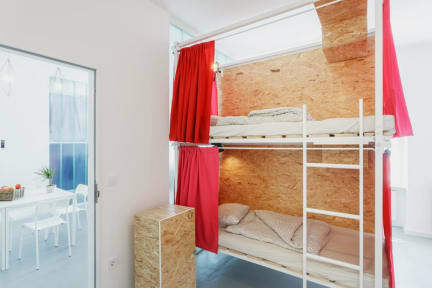 Avenue Hostel, Budapeszt, Węgry : Rezerwuj teraz! The atmosphere was amazing. Employees were very kind and helpful. The breakfast was very tasty. Beds were comfortable and localisation was close to city centre. I really recommend this hostel. W pokojach bardzo kiepskie okna i drzwi, hałas z ulicy (szczególnie tramwaje), jak i wrzaski na korytarzu do 1 w nocy. Udało się przespać 4h, co nie jest najlepszą rekomendacją. Personel powinien egzekwować ciszę przynajmniej od 23 do 7 rano. The check in staff were not really nice or helpful - they had free dorms but yet didn t let me to check in a bit earlier. Got some bad bites as well on both of my arms and they weren t from bed bugs so who knows what it was. The atmosphere is not like in real backpackers place. Overall very average or even below average. Good location tho.